Markets Catch Spring Fever. Is It Justified? 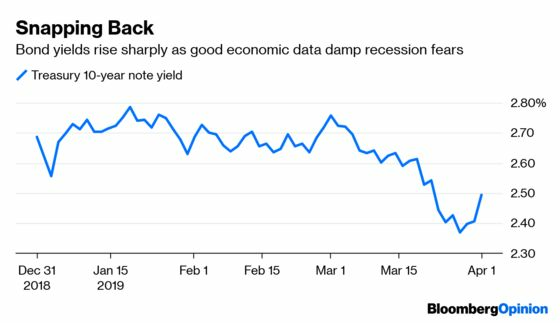 (Bloomberg Opinion) -- For the last couple of weeks, investors have been hearing from a few economists about how signs were emerging that the global economic slowdown was starting to moderate. 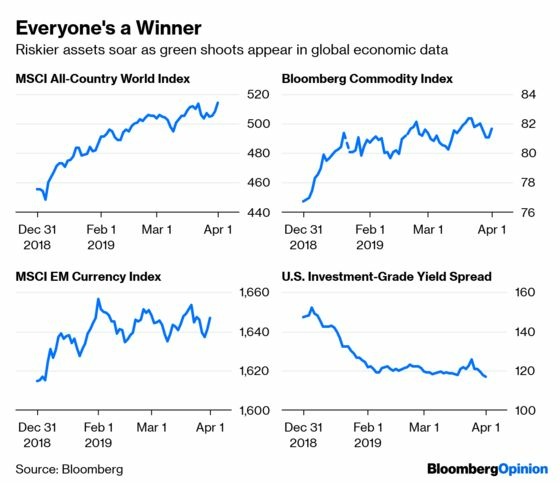 The proof came Monday, as stocks, commodities, credit markets and emerging-market assets all shot higher like green shoots in springtime in response to some surprisingly upbeat economic reports, starting with manufacturing data in China over the weekend. The question now is whether this is sustainable. As the calendar turns to April, attention will soon turn in earnest to how corporate earnings fared in the first quarter. Most everyone seems to expect profits to be flat to lower, which is no one’s catalyst for a continuation of the stock market’s strong performance in the first three months of the year. But what is encouraging is that earnings revisions in the all-important U.S. markets have largely stopped trending lower, and revenue in aggregate should be up about 4.5 percent from a year earlier, according to DataTrek Research. 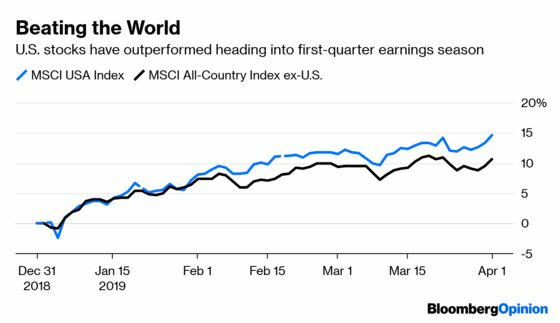 “That’s an underappreciated positive point for U.S. stocks, because confidence in revenue growth serves to offset recent macroeconomic worries,” DataTrek co-founder Nicholas Colas wrote in a research note Monday. Only two of the 11 S&P sectors should show negative revenue growth, with technology down 1 percent because of Apple Inc., and energy down by 3.5 percent because of commodity prices. The other thing to know about stocks is that despite this year’s rally, sentiment still seems to be very bearish. State Street’s monthly index of investor confidence plunged to an all-time low of 69.4 for January and hasn’t recovered much since; it came in at 71.3 for March. To put those numbers in context, the index only got as low as about 82 during the financial crisis and was above 100 – the level at which investors are neither increasing nor decreasing their long-term allocations to risky assets – as recently as last summer. The measure has authority because unlike survey-based gauges, it’s based on actual trades and covers 15 percent of the world’s tradeable assets. The bond market has a way of making even the best and brightest look silly. The recent big rally in U.S. Treasuries pushed down yields on 10-year notes to 2.41 percent at the end of the first quarter. At the start of the year, the median estimate of 59 Wall Street economists and strategists surveyed by Bloomberg was for the yields to end March at 2.88 percent, with the low forecast being 2.50 percent. The current outlook is for yields to end the year at 3 percent. Although that may be too high, it’s probably a safe bet that the next move in yields is to the upside rather than downward. Monday’s market reaction was an indication that bond investors had perhaps become too pessimistic in their outlook for the economy, as 10-year yields jumped 9 basis points to 2.49 percent in response to the positive economic data. Bond investors have “glanced over data reports and moved to the more serious issue of Fed 2019 policy,” FTN Financial interest-rate strategist Jim Vogel wrote in a research note Monday. 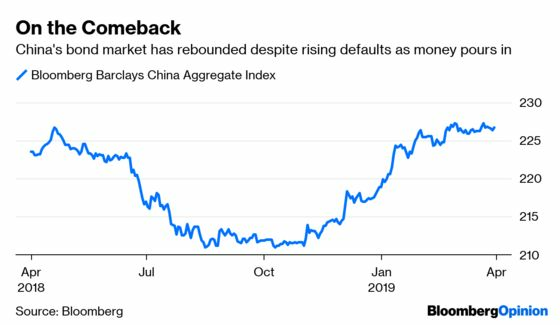 “That changes this week.” The strategists at JPMorgan Chase & Co. led by Nikolaos Panigirtzoglou noted in a research report Friday that the drop in yields in recent months reflects bond traders pricing in an 80 percent chance of a recession. If so, then it stands to reason that yields will only rise if the incoming data continues to hold up and it looks like the Fed will lean toward raising rates by year-end instead of cutting them. Oil is in the midst of an epic rally. U.S. prices surged 32 percent in the first quarter for their best performance in a decade as Saudi Arabia led OPEC and its allies in squeezing supplies to prevent a glut. The gain sounds impressive until you notice that West Texas Intermediate, at about $61 a barrel, is still down more than 20 percent from last year’s high of more than $76 a barrel in early October. 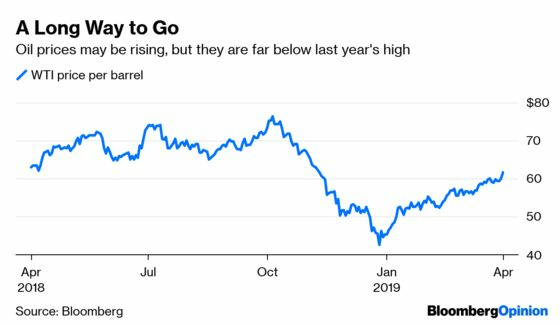 Of course, that just shows how far crude had fallen at the end of 2018. But that’s not to say companies and individuals shouldn’t be worried about even higher prices on the horizon that could eat into profit margins and household budgets. A Bloomberg survey shows that OPEC’s output slipped in March for the fourth straight month, led by deep production cuts in Saudi Arabia, according to Bloomberg News’s Alex Longley and Alex Nussbaum. “It’s OPEC, for once sticking to their supply constraints,” they quoted Scott Bauer, chief executive officer of Prosper Trading Academy in Chicago, as saying. “In the past, they haven’t really heeded their own guidance. But this time they are, and it looks like it’s going to stay that way for the foreseeable future.” Iran’s oil minister concurs. The OPEC+ group could easily extend its agreement on oil-production cuts, Bijan Namdar Zanganeh said. “My understanding is, there is no difficulty extending the cooperation. It should be easy” to prolong the deal beyond the first half of the year, Zanganeh told reporters in Moscow following a meeting with his Russian counterpart Alexander Novak. Australia’s central bank will conclude a monetary policy meeting in a few hours, and while no change in interest rates is expected, it should still bear watching closely. That’s because of the strong manufacturing data out of China, which is Australia’s largest trading partner. Market participants will want to hear whether the Reserve Bank of Australia also suggests that things are turning around in China. Closer to home, conditions don’t look so hot. Australian business confidence fell to the lowest level in almost six years last month in another sign the economy is losing momentum. The index level dropped to 0 in March from 2 the previous month, the weakest reading since July 2013, a National Australia Bank Ltd. report showed Monday. Confidence fell across most industries, while manufacturing was flat and mining increased, according to Bloomberg News’s Michael Heath. “With forward indicators still looking weak, we will be watching closely over the next few months to assess whether conditions in the business sector weaken further,” Heath quoted Alan Oster, the chief economist at National Australia Bank, as saying.